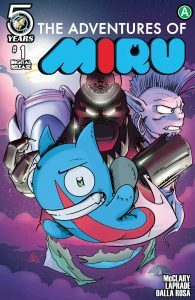 Also new from Action Lab: The Adventures of Miru, a new full-color comic book series written by Rick Laprade and illustrated by J. McClary. “Miru the dragon crashes on Gaia—a realm where dragons no longer exist—and swiftly becomes the most wanted creature around. Without a memory, a past, or an inkling why he’s here, he and his new allies begin a journey that holds the key to the survival of all realities.” Check out the preview over at Flickering Myth.